Indiana is well-known for its corn. In fact, the state was the fifth greatest producer of corn in the U.S. last year. With all of that corn, it’s no surprise that the state is home to some of the best fall mazes around! Enjoy the sprawling, creatively-designed corn mazes of the Hoosier state this fall. Here are our favorites. Visit the Amazing Fall Fun corn maze this fall to have the time of your life! This 12-acre corn maze is the largest in northeastern Indiana. The maze is completed in two different phases: Phase 1 takes up to 30 minutes and if you’re looking for a challenge, try Phase 2, which can take up to an hour. There are other activities available as well, such as pumpkin patch, hay rides, and more. Be sure to check out their Facebook page for deals and giveaways prior to opening day. Tuttle Orchard is a fourth-generation family farm here in Indiana, and a favorite among Indiana residents when fall comes. Each season the orchard has new and fun things to do and for fall, it’s the small four-acre corn maze that attracts visitors. The maze takes about 30 minutes to complete and is fun for all ages. The maze opens in early September, and in addition to the maze, there is also a pumpkin patch, hayrides, and more! Another great place to visit in Indiana for corn mazes is Kendall Family Farm in Greentown, Indiana. A third-generation family farm, Kendall Family Farm is popular with residents of Greentown, Kokomo, Tipton and other areas alike. The corn maze is the farm’s main attraction. 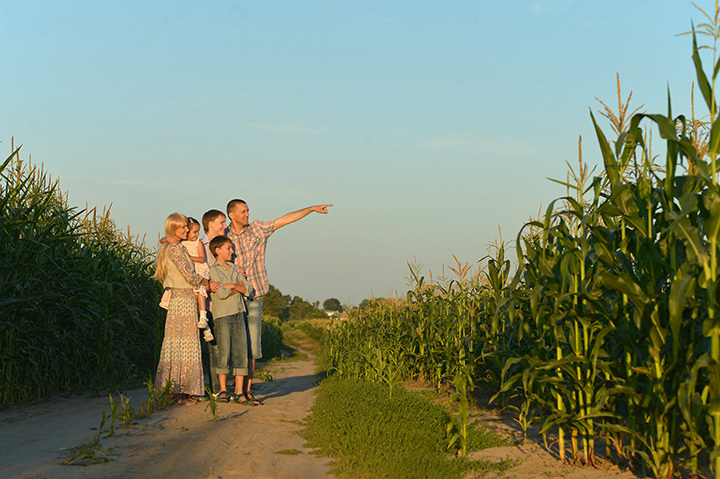 Come to Exploration Acres and get lost in northwestern Indiana’s largest corn maze! The maze is 20 acres and has more than eight miles of pathways. Be sure to visit with the whole family as well as your friends and engage in some friendly competition! Family owned and operated for the last 100 years, the Amazing Maze and Pumpkin Patch farm in Kendallville, Indiana, is a favorite amongst all Indiana residents and a popular fall destination. It’s four acres, and the closer it gets to Halloween, be sure to visit and partake in the haunted maze! There is also a small petting zoo, tube slides, duck races, and more! Head on over to Beasley’s Orchard in Danville, Indiana, this fall and find yourself on adventure as you explore their eight-acre corn maze. Each year, the maze has a different design. Come for Dog Daze at the Maze, a day where you can bring along your furry friend, and help local animal shelters. Beasley’s donates 50 percent of the proceeds to various Indiana animal shelters. Hobson Family Farm in Rockville, Indiana, is the destination for fall and family fun, and has been since 2004. The maze’s design themes generally are made in support of local Indiana institutions, such as tributes to the farm owners and local country radio stations. Be sure to check out their Facebook for savings and giveaways! Come to Ridenour Acres in Angola, Indiana, this fall and get lost in a corn maze! The maze itself is 11 acres and has two different levels: beginner, which takes about 15 minutes and the more advanced level which takes about an hour. The advanced corn maze will test you physically and mentally, as there are six different quiz stations set up to help guide you through the maze. This is perfect for team outings, sorority or fraternity activities, and old fashion family fun competition! Located in Princeton, Indiana, is Lyles Station Corn Maze. Lyles Station has a complicated yet interesting history in that the maze itself is part of the historic site, Lyles Station Historic Preservation Corporation (LSHPC). It was established in 1998 for preserving the life and community of Lyles Station. It’s registered as a historic landmark, but is used for events, field trips, educational outings, etc. The corn maze is a work of art at 10 acres. In October, be sure to come to the maze a special Halloween Haunted Maze. Prepare to be scared! View more Indiana Corn Mazes.